I had finally found the perfect spot......my little piece of heaven. It was right here in my little cubby hole of a cabin, on this wonderful new mattress. And it only took me 5 days to figure it out! Next time I'll know not to bring friends or make friends. (This excludes Lou, who is the only person I know who wants to be alone as much as I do.) I now know not to search an enormous ship & expect to find tranquility. There ain't none! Of course, I was awakened by the C.D. with his morning "you are my sunshine". The rest I tuned out. 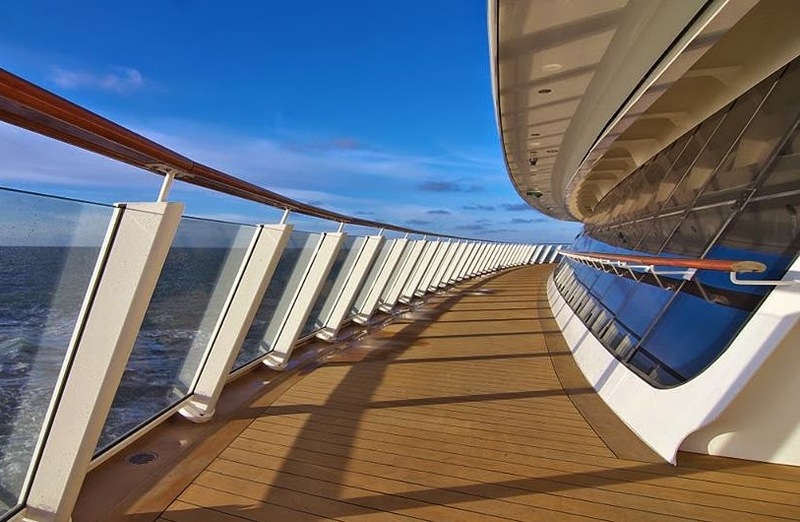 A little later, my cell phone rang.....somehow I had turned off airplane mode....was roaming (internationally) & a robo-call came through........"How would you like to win a cruise to the Bahamas?" (No thank you, I'm on my way there right now.) I shudder to think how much that mistake will cost me when the phone bill comes. Went right back to sleep......next thing I hear is the Captain's (calm & quiet) voice. (Oh no...... it must be noon.). I could barely hear his nautical report coming in under the door. But he did seem to talk a long time. I just hope it wasn't something important cause I couldn't make any of it out. Lou texted that she was off to her wine lover's lunch (she'll probably be worthless the rest of the day.) I put myself together; & was off in search of sustenance. Went to O'Sheehan's to try their famous chicken pot pie. Not overly impressed....3/4 of it was crust, not enough stuff. So, I switched to fish (w/o the chips). As with most of the fried foods, you wished for paper napkins to soak up all the grease. I know, we should be grateful they use cloth napkins. The noise from the Nickelodeon trivia for the kiddies in the atrium down below was just too much. Made a quick dash to the internet cafe to check email ; & then on to find a reading spot. It was crowded & too hot out on the Waterfront. I started a new book in the lounge outside of Cagney's Restaurant; but had to stop when the waitstaff started piling in about 4. I headed to the Studio Lounge; & was surprised to find Lou sitting in there. She had already had her wine induced siesta. We sat for a good while having coffee; & chatting with some of the other "singles" that came through. Although she's not the carnivore that I am, she said she would go with me to Moderno Churriscaria for dinner. This dining concept is fashioned from Argentinian beef houses, which we did not partake of during our So. American cruise in 2010. For a $20 surcharge, gauchos will carve an array of meats tableside. This is the one alternative restaurant I was really interested in trying. We went home to rest until such time as one of us got hungry. We did not have reservations; but they we're able to seat us right away. They brought a basket of little Brazilian cheese rolls, hot & luscious. 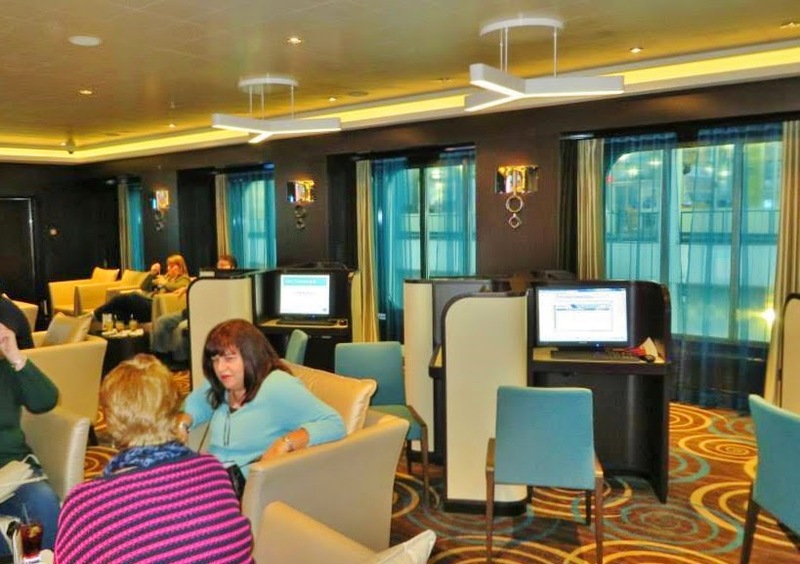 Next we visited the salad bar, which is unlike any other on this ship. This display looked as if it had come from the galley of a Crystal ship. There was prosciutto, chorizo, Brie, Stilton, artichoke salad, hearts of palm salad, marinated asparagus, sweet corn & pecan salad, and a fabulous grilled portobello mushroom salad. There were other things from which you could make a salad. I just focused on the unusual stuff. I was in heaven! Next came a nonstop parade of skewers of grilled meats, each one better than the next. It was impossible to try everything; but we did our best. My favorites by far were the lamb chops, beef marinated in garlic & sea salt, chorizo with red wine & Parmesan cheese, and the Portuguese sausage with herbs & garlic. Side dishes were garlic mashed potatoes, buttered rice, black beans & fried plantains. There was grilled pineapple to clear your palate. 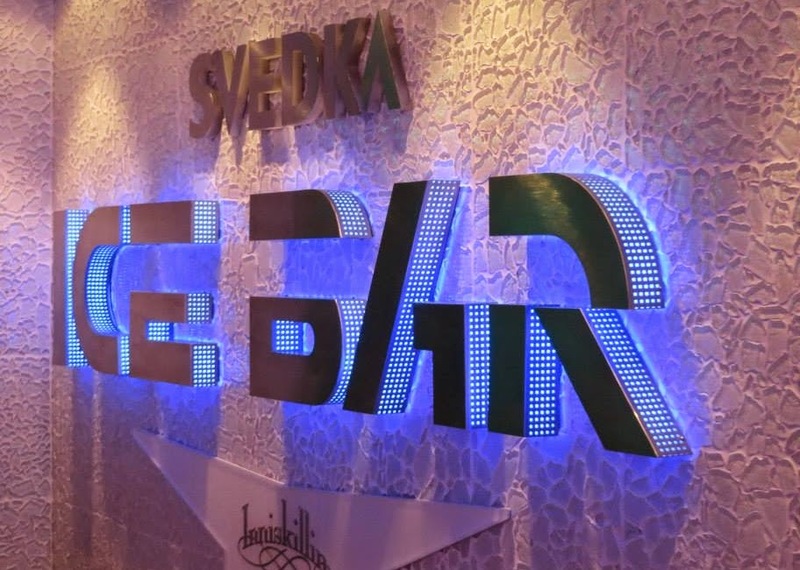 As we took the lonngggg walk to the forward elevators, we passed the Svedka ice bar (another NCL FIRST). 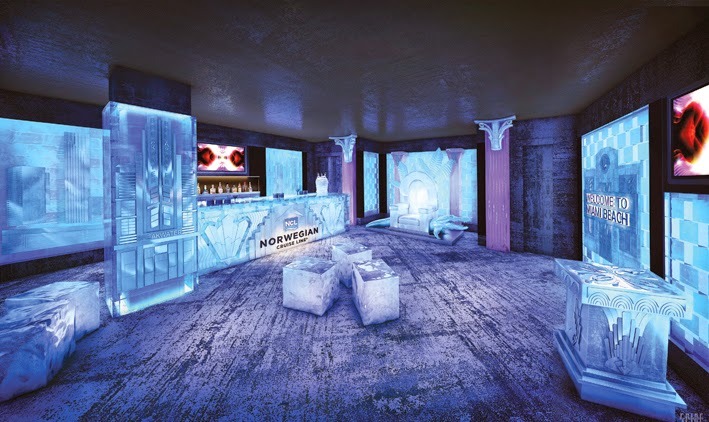 Since I had never visited an ice bar while in Scandinavia, I really wanted to experience it. Lou sat outside; & people watched. There's a $20 cover charge, which includes 2 drinks. 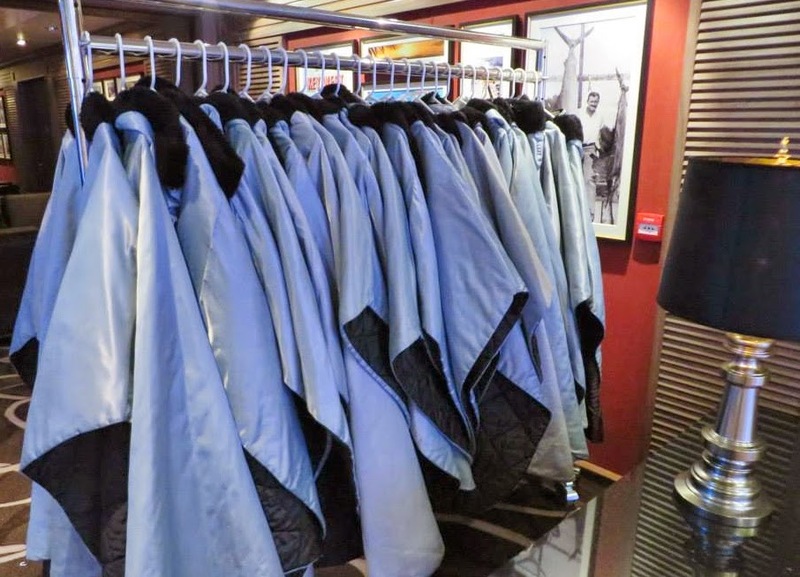 They provide fur lined ponchos & gloves. (I had to pretend like I wasn't wearing sandals.) The bar itself was much smaller than I thought it would be; & they never let more than 25 in at a time. It was just the bartender & I for a good while. The decor is South Beach Miami, carved in ice. There is a huge ice throne. The sweet Indonesian bartender took some photos of me; & we got to talk a bit about his home. He certainly wasn't comfortable in this frigid cold; & I wondered who he must have pissed off to get assigned to "Siberian Hell". I downed my drinks pretty fast, as the glass made of ice freezes your lips. When I came out my glasses were so fogged over I couldn't see to sign the check. I found this evening so enjoyable, I didn't mind spending the extra money. As we made our way home at 10:30; others we're just heading out for the big "glow party". Another wild &crazy night on deck at Spice H2o. One party a week is enough for me. The icing on the cake.......we had passed through some rain storms; & the ship began to shimmy & roll a bit. My book & cozy bed were calling. Is it just a coincidence that my towel "animal" is an Eskimo tonight???? ?